Olympus Om-1n, 50mm lens, Agfa Vista Plus 200 ISO film, f16 1/1000th. Monknash beach taken from the cliffs overlooking the beach in the Vale of Glamorgan in South Wales. the rocks here look so interesting, the lines across the beach, the lines in the cliff face, the different colours of greens, browns and blue with the interspersed rock pools. 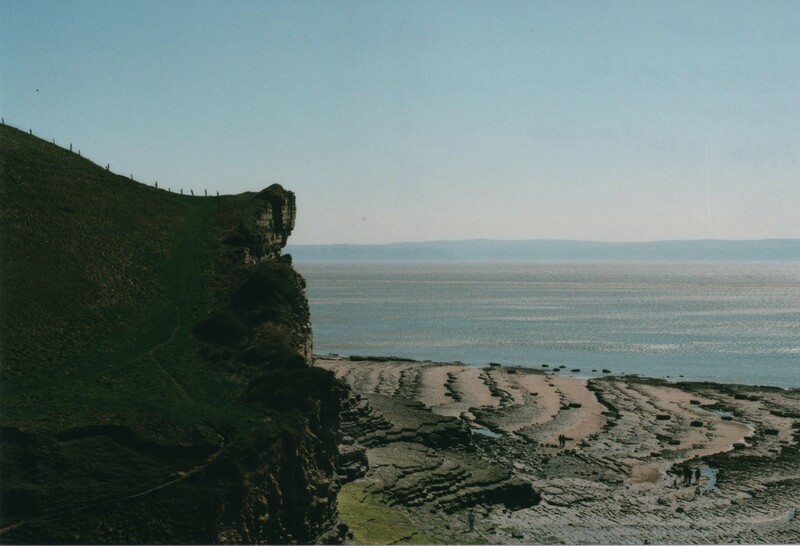 And the sparkling sea of the Bristol Channel with England off in the distance on the horizon. I also like the shapes here, the path leading up the cliff face, zig-zagging to the fence that runs across the top, the cliff jagged and jutting out filling the left third of the image, and then again the formations of the rock on the beach itself. I am thoroughly please with myself on this shot, in fact I liked it so much I may have more soon as I’ve visited this spot a number of times recently again.